Domenici's apparent decision has created a political vacuum affecting both the parties. Looks like it's going to be a heck of a race next year. As my trusty experts told me, an open Senate seat is a very rare opportunity in New Mexico. We tend to keep our senators for decades. 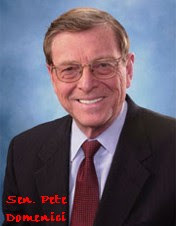 In fact, Domenici's first run for Senate, in 1972, was the the first year I was eligible to vote. The three Congresspeople from New Mexico -- Udall, Wilson and Pearce -- are all being coy at this point. Udall and Wilson's staff sent flowery press releases praising St. Pete. Pearce's office never got back to me. I'm sure they want to give Domenici the courtesy of making his announcement before they pounce. On the Dem side Diane Denish and Martin Chavez, both of whom have been running for governor, are looking at the race. Don Wiviott, who actually has declared his candidacy, says he's in it for the long run despite the likelihood of bigger names jumping in. Another candidate, Jim Hannan, says he's hoping Udall will take the plunge. I never did find Patsy Madrid today. On the GOP side, state Land Commissioner Pat Lyons told me he's considering the race. Their investigation revealed that in June, July and August I used 4,500 gallons (50 gallons a day.) That's 67 percent less than the average household. Makes me thirsty just thinking about it. Yay! I'm not an evil water hog -- like that wretched Mark Oswald, who used 13 percent more than the average God-fearing Santa Fean. How do I do it? I only drink and shower in bottled water. And I throw the empties down in the arroyo. So there. As a little reward to you who read this far, here's a free, legal download of a 1985 NRBQ concert, courtesy of the band's Web site.